This is an incomplete draft webpage, and is still a work in progress. Any and all statements, especially the conclusions, may be changed until the analysis is complete! Fig. 1. 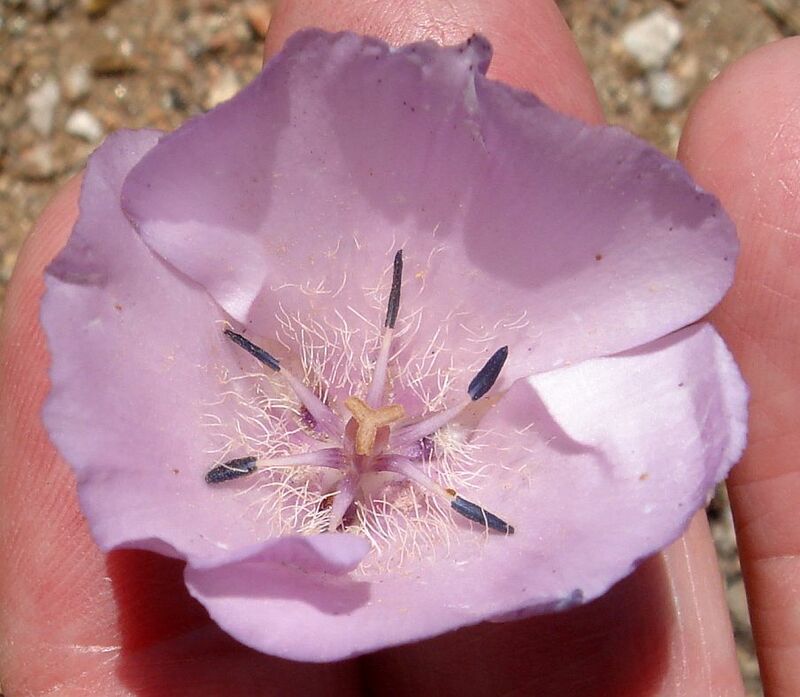 Left: Calochortus davidsonianus, from hill south of Banning in the San Jacinto Mountains, by Tom Chester on 1 June 2014. Right: C. splendens, from Lockwood Valley in Kern County, by Ron Parsons. Note the striking difference in the length of the anthers compared to the filaments, and that the hairs of C. davidsonianus are fewer, shorter, a bit straighter, less tangled, and do not extend as far up the petal as do the hairs of C. splendens, which mostly or completely hide the filaments. 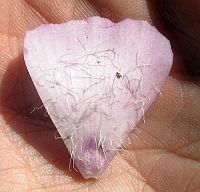 The distal end of the petals is generally much more finely toothed for C. splendens. In 1903, Abrams collected a plant in extreme southwest San Diego County that differed significantly from the type specimen of C. splendens, which was probably collected in Monterey County by David Douglas shortly before the year 1835. In 1923, in his monumental Illustrated Flora of the Pacific States, Abrams named his specimen C. davidsonianus, presumably in honor of Anstruth Davidson, who published a Flora of Southern California in 1923. Abrams distinguished his new species from C. splendens in his key by its shorter anthers, 4-6 mm long vs. 8-10 mm long for C. splendens, and by how far up the petal the prominent white hairs were found, only in the lower third of the petal for C. davidsonianus vs. to the middle for C. splendens. In addition, in his description, Abrams stated the anthers of C. davdisonianus were shorter than the filaments, whereas the anthers of C. splendens were equal in length to its filaments. 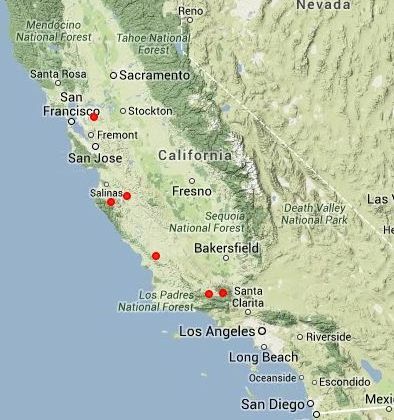 Abrams gave the range of C. davidsonianus as being from Santa Barbara to San Diego counties, and for C. splendens as being from Santa Clara County to San Luis Obispo. 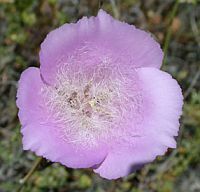 However, Munz, in his 1938 Manual of Southern California Botany treated these two species as synonyms, as did Ownbey in his 1940 monograph on Calochortus, who felt that the differences in the anther length was not sufficient to treat these as separate species. Things began to change in 2003, when the molecular work of Patterson and Givnish showed that these two species were not only separate, they weren't even the closest species to each other, with C. davidsonianus being sister to C. flexuosus, and C. splendens being sister to the ancestor of C. davidsonianus and C. flexuosus. 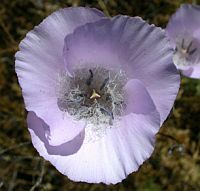 Gerritsen and Parsons, in their 2007 book on Calochortus, discussed the history of these two species, but only concluded that It is possible that these are two separate species. Since that time, Ron has become firmly convinced that these are two separate species, with C. splendens having deep chalice-shaped flowers with long white tangled hairs at base, and C. davidsonianus having more open flowers with the short cropped hairs at the base. Fig. 1 shows the differences in the hairs in two of Ron's photographs. When I became aware of this, after being alerted to these two species by Lara Hartley, I decided to try to do a simple quick analysis that might reveal one way or the other whether these were separate species. I took advantage of the many photographs of "C. splendens" at Calphotos, as well as additional photographs from Ron and Lara, to measure characteristics visible in the photos. I quickly found that there was solid evidence that these two species were separate morphologically, and that the two different morphologies clearly had different geographic distributions. In addition to Ron's distinguishing characteristics, a Principal Components Analysis (PCA) showed that the species are also distinguished by how far up the petal the hairs extend, the anther length, and the ratio of the anther to filament length, all exactly the distinguishing characteristics found by Abrams. Furthermore, there was a weird disjunct in the geographic localities for the plants that appeared to be all C. davidsonianus that seemed too disjunct for them to be the same species. Ron reported that a friend of his noted that this population had differences in the bulb and tunic between the disjunct populations. A simple comparison of pictures shows that the flowers of the disjunct populations look very different as well, and quite possibly are different species. However, since I am totally unfamiliar with the plants where this disjunct population lives, more work needs to be done before reaching any conclusion about whether that disjunct is a distinct species. This paper presents photographs of the two (maybe three) species, an analysis of their morphological differences, along with the geographic distribution of these two (maybe three) species from that analysis. Clearly, it would be preferable to measure actual specimens and repeat this analysis, which would also give a good range of measurements for the characteristics of each species. But this paper shows that photographs are good enough to establish that these two species are indeed separate, and are able to delineate some of the major differences between these species. Fig. 2 shows thumbnails of the photographs that were measured for this analysis; click on the thumbnails to get the original version of the picture. Most of the photographs simply came from going through the the first few pages of Calphotos photographs of plants labeled as "C. splendens", selecting every photograph that showed flowers well enough to be measured reliably. After the initial analysis revealed that most photos were actually of C. davidsonianus, and that these came from north of Los Angeles County, I searched Calphotos just for photographs from the northernmost counties which had vouchers of "C. splendens", in order to get more photos of the true C. splendens. When the photographs were measured, no attention was paid as to where the photograph was taken. Only after the analysis was done was the location digitized to make the maps of the geographic distribution of each species. A few photographs were included in Fig. 2 that couldn't be measured for all flower parts because they show close-ups of the hairs well. Fig. 2. Thumbnail photographs of C. davidsonianus (left) and C. splendens (right). Most of these photographs were measured for the analysis in this paper. Because none of the photographs had scales, all the measurements were divided by the measured petal width, to give scale-free intrinsic measurements of the properties of the flowers. However, since the orientation of the camera relative to the flower varied, that introduces an additional scale factor which will spread even the scale-free measurements. Fortunately, that additional scale factor affects the measurements of both species in the same way, smearing the measurements in a consistent manner, which does not affect the PCA to first order. The PCA clearly separates the flowers in the photographs into two species that correspond to C. davidsonianus and C. splendens. But since a PCA is a mysterious black box to most people, we first present plots of the key characteristics found to be important in the PCA, which can be more easily understood. Fig. 3 shows the two best independent discriminating characteristics, how straight the hairs are and how tangled they are. Note that these truly are independent characteristics, since straight hairs can be oriented in different ways and produce highly tangled hairs. Fig. 3. Plot of how tangled the hairs are (0 represents hairs that aren't tangled at all; 1 represents hairs completely entangled) vs. the straightness of the hairs (0 represents hairs that are completely curly; 1 represents hairs that are dead straight). Fig. 3 shows that you don't need a PCA to discriminate these two species; a simple glance at a photograph to check on the hairs will suffice. Fig. 4 shows the third and fourth best discriminating characteristics, the hair length and the hair petal coverage. The hair length is one of the more problematic characteristics to measure in a photograph, since in general only the hairs at a given distance from the camera lens are in focus, and produce the best measurements. Depending on the focus and distance of the hairs from the lens, the hairs can appear to be longer or shorter than a "representative" hair. 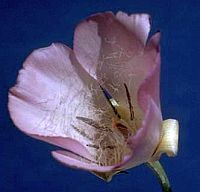 The hair petal coverage is similarly affected by the orientation of the petal to the camera, so the values measured in the photographs may not exactly correspond to values measured in real life. Fig. 4. Plot of the hair length, normalized by the petal width, vs. how far up the petal the hairs are present. Fig. 4 shows quite good separation between the two species as well for the vast majority of the measured flowers. Two of the C. splendens flowers that were clearly separated by species in Fig. 3 now overlap in both characteristics with the most extreme flowers of C. davidsonianus. This may be an artifact of measuring photographs at different orientations, or it may simply mean that these are "generally" good separating characteristics, and not 100% reliable. Fig. 5 shows the geographic distribution of the flowers measured in this analysis. There is a clear geographic cohesion to the plants that measure to be C. splendens. Plants that measure to be C. davidsonianus occupy coastal southern California as a solid block, but there is an unusual disjunct location in extreme northern California, which strongly suggests it is yet a third species that has been confused with C. splendens. Photographs of that species, shown in the next section, appear to indicate it is separate from C. davidsonianus. Fig. 5. Geographic distribution of C. davidsonianus (left) and C. splendens (right). Fig. 6 shows what may be an undescribed species from Glenn County. More work needs to be done to understand this population. Fig. 6. 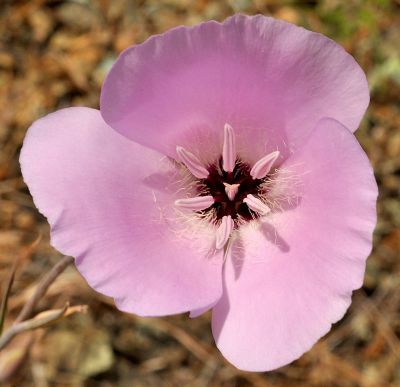 Left: Calochortus davidsonianus, from hill south of Banning in the San Jacinto Mountains, by Tom Chester on 1 June 2014. Right: a possible undescribed species, from Road 306 in Glenn County on 5 June 2010, by Ron Parsons. Note the striking differences in the anthers and filaments; and the different color of the hairs. 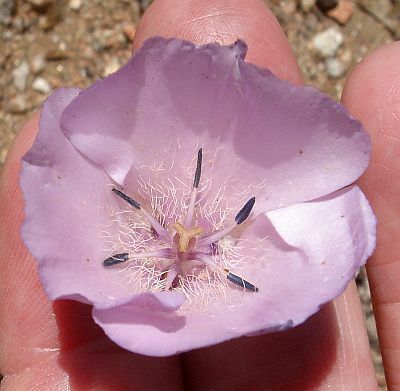 The difference in the color of the center of the flower is probably not significant, since some specimens of C. davidsonianus also have dark spots. I thank Ron Parsons for his email stating his belief that C. davidsonianus was a separate species with different hairs on the petals. The resulting email exchange resulted in this article. I also thank Ron for sending photographs showing the difference between the two species, supplying additional photographs and locations for this article, and comments on this page.